A crew takes down the Ronan arch on Main Street. The main support logs are removed. Dave Marmon cut the last steel footing on the arch. : Sackett and Robert Jennison of Jennison Tree Service clear snow off the arch before loosening the bolts. RONAN – The iconic Ronan arch is now missing as the welcoming feature on Main Street while a new one is being constructed. On Thursday, the logs came down. 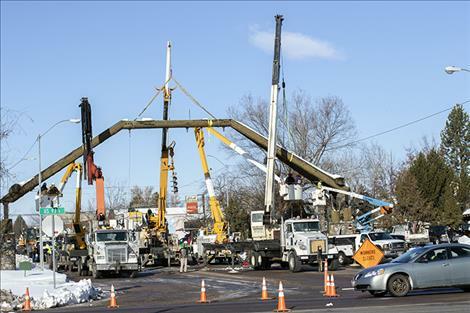 A half dozen large utility trucks clogged a section of the street as work was done to remove the arch. The street was closed for about three hours. 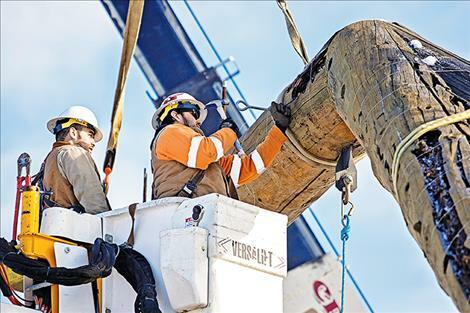 The Main Street closure between U.S. Highway 93 and 1st Ave SW was a precaution to allow crews the ability to work safely in the area as they dismantled the mammoth log structure. For nearly two decades, the arch has been the gateway to downtown Ronan. It is also the longest public arch in Montana. Unfortunately, exposure to Montana’s harsh elements has led to early weather rot and the arch's untimely demise. It was built by the Ronan High School Senior Class in 2002. A few years ago, a grass root effort made up of community members, business owners, city officials and Ronan High School students and staff was formed with a goal to preserve and restore the arch and sign. The Restore the Ronan Arch project has raised over $40,000 from fundraising, private donations and grants. The project has an estimated budget of around $55,000. 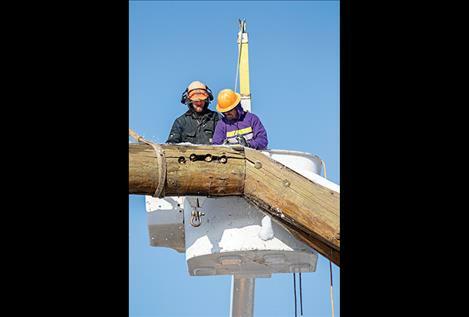 On Thursday morning, crews from the City of Ronan, Access Montana, Jason Delaney Engineering, Gary Cote, Jennison Tree Service, Mission Valley Power and Western Building Center began the dismantling portion of the project. 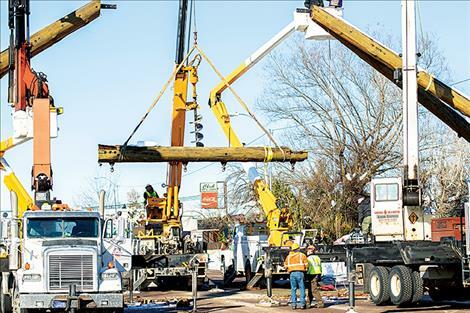 The crew of around 15 people worked together like a well-greased machine, using three cranes to stabilize the main structure and the two A-frame ends of the arch. Two crews worked with bucket trucks moving more than 40 feet in the air on opposite ends of the main beam to loosen the main bolts on the arch. 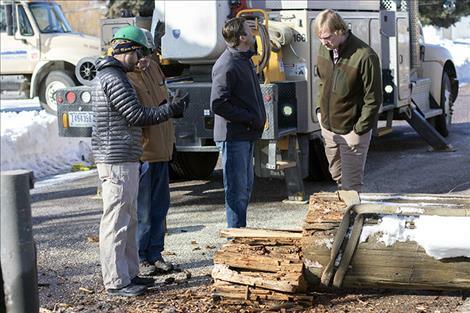 “The tricky part will be holding up the supporting timbers on either side of the old arch while taking out the support bolts and removing the center section,” said Jay Preston, one of the original Ronan Arch designers as he watched the arch come down. 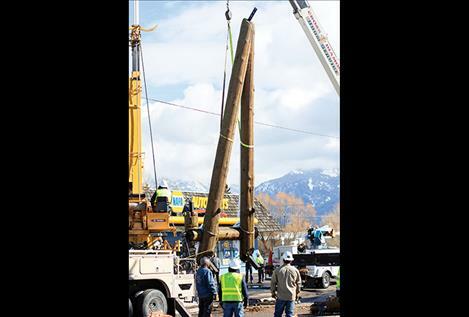 Some of the support bolts and nuts required a little more attention than others, but they were finally loosened and removed, which allowed the crew to safely lower the center section to the ground. 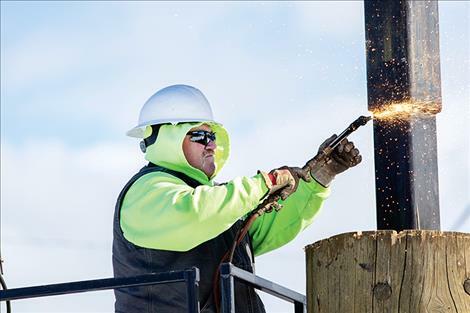 With sparks flying, city employee Dave Marmon used a cutting torch to release the end pieces from their steel supports, and after they were free, the project was complete. The remainder of the Restore the Ronan Arch project involves work on the new Ronan sign. The replacement logs also need to be peeled and cut. After the logs are finished, the arch will be reassembled. The Ronan High School seniors expect to finish the new arch by the end of this school year. The City has plans to hold a dedication ceremony for the new arch sometime in the first part of the summer. Many volunteers and sponsors worked on the arch project, including the Arch Committee, Ronan High School students, the City of Ronan and Street Department staff, Western Building Center, Mission Valley Power, Access Montana, Jason Delaney, Cross Diamond Boom Service, Access Montana, Jennison Tree Service, Dupuis Lumber, Cordell Hardy, Les Schwab, Valley Bank and Glacier Bank. Donations toward the project are being accepted at Valley Bank of Ronan and Glacier Bank. Information can also be found at www.lakecountycdc.org or by calling 406-676-5901.